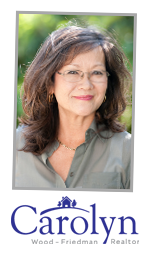 Carolyn Wood is a seasoned professional who knows the SB area intimately and will fight for the highest return $ on your property. She hosted multiple open houses and ran beautiful color newspaper ads for our home of 22 years. She was always available and responsive via internet, text or phone. Her attention to detail was exceptional and we will definitely use her services again. Carolyn was highly recommended, she went above and beyond what we had anticipated, she listened carefully to our needs & she was on top of everything and knew the people to contact to make our transaction smooth. Carolyn had worked with us on a recent home purchase and we found her knowledgeable, professional and accessible, so we used her again for the sale of our other property. Carolyn has the ability to really listen to your needs and can make suggestions toward making the transaction more profitable. Carolyn was our Agent when we bought and sold our previous home, we appreciate her honesty and integrity. Carolyn was just a phone call away. I chose Carolyn for her professionalism and tract record with results! We were impressed with her knowledge of homes she represents as well as the area, she anticipated many problems and took care of them promptly. We met Carolyn at an open house and instantly liked her style, she handled every problem promptly, we loved working with her. Carolyn was very open and honest and kept us well informed at all times. We have already recommended to our friends. I called on and met numerous Realtors, after speaking with her it was immediately apparent she was experienced, professional and competent. We thoroughly enjoyed working with Carolyn, she was down to earth and did not pressure us. We intend to use her again for our upcoming real estate needs. Carolyn helped me get through a very sensitive time in my life, I appreciated her professionalism and compassion. Believe us when we say that working with Carolyn has been the most pleasant and least stressful real estate purchase we have experienced. Carolyn had done work for us before, we were pleased with er knowlege and efforts. Carolyn was referred by friends as they said she did an excellent job & listened carefully to their needs. Carolyn has an excellent reputation in our community & when we put our home in the capable hands we were able to relax knowing our needs were being cared for completely. Carolyn’s good reputation & she did so many extra things to make this transaction easy for me. Carolyn was incredibly caring and went far beyond what was necessary to assist me, she was on top of every phase of selling my property. Carolyn has helped our family for years. She works hard for her clients & we trust her. She kept in touch from the start of the transaction to the end and after escrow closed! We have used Carolyn to assist in Selling and our purchases for over 20 years and about 10 transactions!